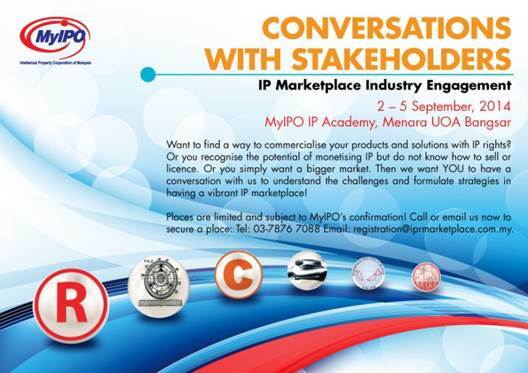 Recently, MyIPO has launched the IP Marketplace portal, and would like to have a conversation and consultation with relevant industry stakeholders in understanding the constraints and challenges in commercialising and monetising IP rights, as well as provide a platform for the buying and selling of IP rights that is viable and suitable for the relevant stakeholders. Be part of this exciting event, block your dates in your smartphone or diary now! (2nd – 5th September, 2014). Don’t miss out the chance to make your opinion count and help shape the development of a vibrant IP Marketplace in Malaysia! Click here for the event flyer.